03/13/2019 - The Hershey Bears turned a 2-0 deficit into a thrilling, 5-3 victory on Wednesday night over the Springfield Thunderbirds at Giant Center. Jayson Megna earned first star honors with one goal and two assists in front of 10,317 fans on Hersheypark Pass Night. Springfield grabbed the game's first goal and a 1-0 lead courtesy of a fortunate bounce in the midst of a forecheck. Ilya Samsonov left his crease to play the puck in the trapezoid behind the net, and a pass banked off Colby Williams' skate and to the net front for an open Sebastian Repo. He slammed the loose puck into a vacated net to give the Thunderbirds a 1-0 lead at 17:45. Shots after 20 minutes were 13-7 Springfield. The Bears went down 2-0 at 6:04 of the second period on a breakaway goal by Jean-Sebastien Dea. The Thunderbirds successfully killed a Dea tripping minor at 3:54, and he won a foot race shortly after leaving the penalty box and poked a shot past Samsonov. Hershey suddenly turned the tide with two goals only 1:09 apart late in the period, starting with a center-point blast from Ryan Sproul. At 17:18, Sproul's shot beat Springfield goaltender Chris Driedger low, glove side to cut Hershey's deficit to one. Seconds after the ensuing face off at center ice, Riley Stillman was called for a tripping minor when Megna was hauled down on a semi-breakaway chance. The Bears hit pay-dirt on the power play when Devante Smith-Pelly buried a back door feed from Mike Sgarbossa to tie the score at 2-2 at the 18:27 mark. Shots after 40 minutes were 24-19 Hershey after 40 minutes. The Chocolate and White tallied their third and fourth unanswered goals of the game at 7:00 and 9:10 to jump out to a 4-2 third period lead. First, Sgarbossa fired a perfect, cross-ice pass from Aaron Ness, into the net after Ness circled the perimeter with the puck until a passing lane opened. Next, Megna sniped a quick shot past Driedger upstairs following a crisp pass feed Riley Barber. Springfield trimmed their deficit to 4-3 after Bobby Farnham cashed in on a breakaway chance at 10:39. Hershey's penalty kill unit had their number called only once the entire night, and it came at a crucial moment down the stretch in the final stanza. Barber was called for a hooking infraction in the offensive zone at 16:45, but Hershey's penalty kill stood tall. Sgarbossa hit the empty net at 19:53 to secure the win and round out the 5-3 final. Hershey's record at Giant Center this season improved to an outstanding 20-10-0-1 in the win. The Bears overall record improved to 34-22-2-4. The Hershey Bears return to action on Friday, March 15 when the Toronto Marlies make their lone appearance in Hershey this season. It's Fairview Golf Course Bears Logo Chip Night and Dietz & Watson Dollar Dog Night. Puck drop is scheduled for 7 p.m. 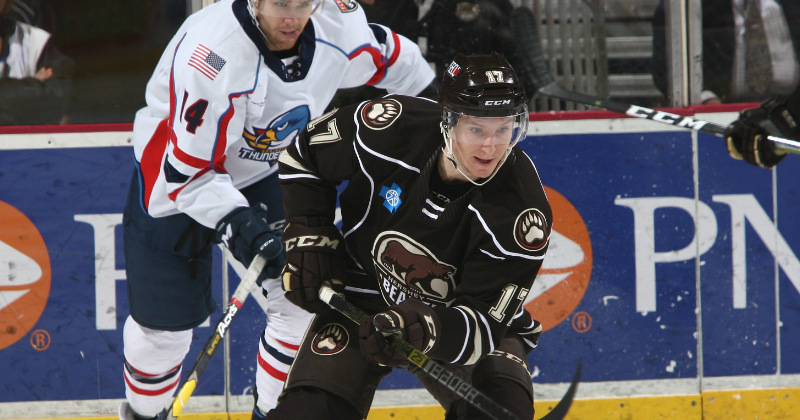 Ticket information is available online at HersheyBears.com.